View of [Peconic?] 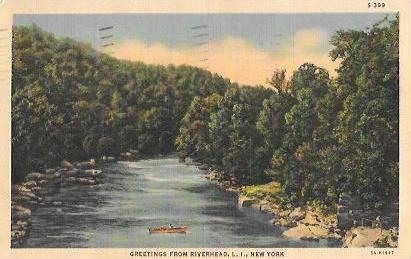 river, which is lined by trees on both sides. There is a person in a row boat in the middle of the river. Message and addressee information, both handwritten, on verso. “C.T. Art Colortone” Reg. U.S.Pat. Off. Made only by Curt Teich & Co., Inc., Chicago. “C.T. Art Colortone” Reg. U.S.Pat. Off. 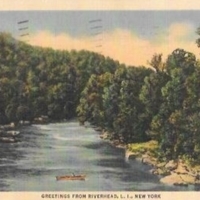 Made only by Curt Teich & Co., Inc., Chicago., “Greetings from Riverhead, L.I., New York,” Hofstra University Library Special Collections: Digital Collections, accessed April 21, 2019, https://omeka.hofstra.edu/items/show/2734.